13 Commonwealth is located on the north side of Commonwealth, between Arlington and Berkeley, with 11 Commonwealth to the east and 15 Commonwealth to the west. 13 Commonwealth was designed by Parker, Thomas, and Rice, architects, and built in 1907 by J. W. Bishop Co., builders, as the home of George Manning Nowell and his wife, Anna Lee (Ames) Nowell, daughter of former Governor Oliver Ames. Their son, Ames Nowell, lived with them. The Nowells previously had lived at 522 Commonwealth. 13 Commonwealth replaced an earlier house built ca. 1868 which was acquired by Anna Nowell on February 28, 1907. The original house shared a front portico and stairs with 11 Commonwealth, and on July 6, 1907, Anna Nowell entered into an agreement with William and Mary (Ruby) Morrison, owners of 11 Commonwealth, to permit the removal of the portico and stairs at 11 Commonwealth while protecting the portico and stairs at 11 Commonwealth. Anna Nowell is shown as the owner on the original building permit application for the new house, dated August 1, 1907, and on the application to tear down the old house, dated August 14, 1907. Click here for an index to the deeds for 13 Commonwealth. 13 Commonwealth, front elevation, by Parker, Thomas and Rice (1909), courtesy of Grassi Design Group, Inc.
George M. Nowell was an attorney. In the 1880s and 1890s, prior to studying law, he had been a concert pianist and, in the 1890s, a member of the faculty of the New England Conservatory of Music. In March of 1916, Ames Nowell married in London to Margaret Anna Laura Harrison. After their marriage, they lived at 13 Commonwealth with his parents. In September of 1916, George Nowell went to France to serve as a volunteer ambulance driver in Paris. Anna Nowell continued to live at 13 Commonwealth during the 1916-1917 winter season, and Ames and Margaret Nowell lived with her. By the next season, they all were living at 53 Pinckney. By 1920, George and Anna Nowell lived in Los Angeles. On April 27, 1917, 13 Commonwealth was purchased from Anna Nowell by Mrs. Annie Lee (Allen) Chauvenet, the widow of St. Louis attorney Louis Chauvenet. She previously had lived at 180 Beacon. She lived at 13 Commonwealth during the 1917-1918 winter season, but moved thereafter and by 1920 was living at 101 Chestnut. On June 5, 1918, 13 Commonwealth was purchased from Annie Chauvenet by cotton broker Malcolm Graeme Haughton, Jr. He and his wife, Marian (Shaw) McKean Haughton, made it their home. They previously had lived at 236-238 Beacon. They also maintained a home, Pride’s Hill, at Prides Crossing which was seriously damaged in a fire on October 24, 1921. Quincy Adams Shaw McKean, Marian Haughton’s son by her previous marriage to Henry Pratt McKean, lived with them. On April 10, 1920, Malcolm Haughton transferred 13 Commonwealth into his wife’s name. Quincy Adams Shaw McKean married in July of 1920 to Margarett Williams Sargent. After their marriage, they lived at the Hotel Agassiz at 191 Commonwealth and in Prides Crossing. In February of 1928, Malcolm Haughton applied for (and subsequently received) permission to add a third floor addition to the rear bay of 13 Commonwealth. Malcolm Graeme Haughton died in November of 1929. Marian Haughton continued to live at 13 Commonwealth until about 1941. On December 21, 1942, Marian Haughton transferred 13 Commonwealth to the First Region Council of the Citizens’ Committee for the Army and Navy. Quincy Adams Shaw McKean, Marian Haughton’s son by her first marriage, to Henry Pratt McKean, was chairman of the committee. 13 Commonwealth remained the headquarters of the Citizens’ Committee for the Army and Navy until the end of the war. The committee transferred the property back to Marian Haughton on April 29, 1946. The property was shown as vacant in the 1946 City Directory. In June of 1946, she filed for permission to convert 13 Commonwealth from a single-family dwelling into a radio studio. She subsequently abandoned the application. On November 5, 1946, 13 Commonwealth was purchased by Frederick L. Arata, a retail liquor dealer and real estate investor. He and his wife, Annette Flossie (Crovo) Boggiano Arata, lived in Brighton. In November of 1946, he filed for (and subsequently received) permission to convert the house from a single-family dwelling into medical offices on the first and second floors, and five apartments on the remaining floors. On July 29, 1955, 13 Commonwealth was acquired from Fred Arata by Dr. Gerald C. McCarthy, a physician. He lived in one of the apartments and also maintained his medical practice in the building. He previously had lived at 5 Bay State Road. 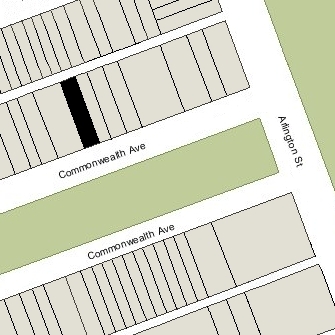 Gerald McCarthy continued to live at 13 Commonwealth in 1960, but by 1962 had moved to Dorchester. He continued to maintain his office at 13 Commonwealth. On September 7, 1999, 13 Commonwealth was purchased from Gerrard Property Trust by the Beal Ventures Nine LLC (Robert L. Beal, manager of record). On October 26, 1999, 13 Commonwealth was purchased from Beal Ventures Nine LLC by Robert G. Bannish, trustee of the 13 Commonwealth Realty Trust. In January of 2000, the trust filed for (and subsequently received) permission to convert the property back into a single-family dwelling. 13 Commonwealth remained a single-family dwelling in 2015. 13 Commonwealth replaced an earlier townhouse, with the same address, built ca. 1868. It was one of two contiguous houses (11-13 Commonwealth) designed by architect Nathaniel J. Bradlee and built for merchant Frederick Hall Bradlee. Although they shared the same surname, it does not appear that Nathaniel Bradlee and Frederick Bradlee were closely related. Frederick Bradlee had 11 Commonwealth built on a lot with a 21 foot frontage, and 13 Commonwealth built on a lot with a 29 foot frontage. To compensate for difference in lot sizes, 11 Commonwealth was five stories (plus basement) whereas 13 Commonwealth was four stories (plus basement). 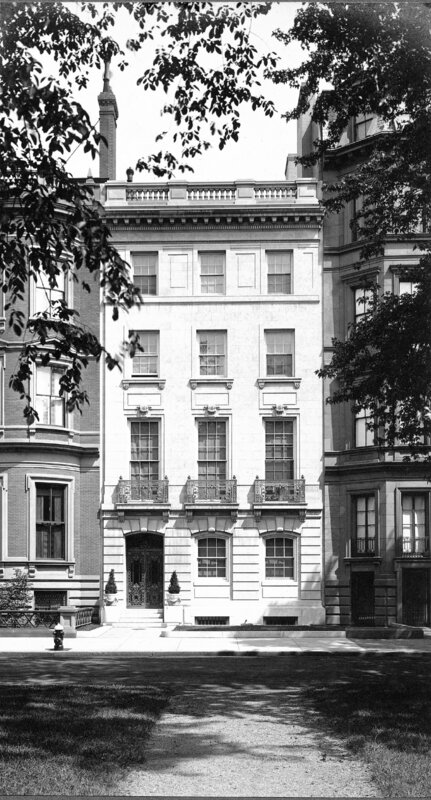 When the houses were completed, Frederick Bradlee sold 11 Commonwealth to his daughter, Elizabeth Gair (Bradlee) Abbot, the wife of dry goods commission merchant Henry Ward Abbot. They made it their home. Frederick and and his wife, Lucretia (Wainwright) Bradlee kept 13 Commonwealth as their home. They previously had lived at 147 Tremont. Lucretia Bradlee died in August of 1886. Frederick Bradlee continued to live at 13 Commonwealth, joined by his son-in-law and daughter, Frederic and Lucy (Bradlee) Stone. They previously had lived at 6 Gloucester. Frederic Stone was a broker and commission merchant in the China trade. Frederick Bradlee died in September of 1888. 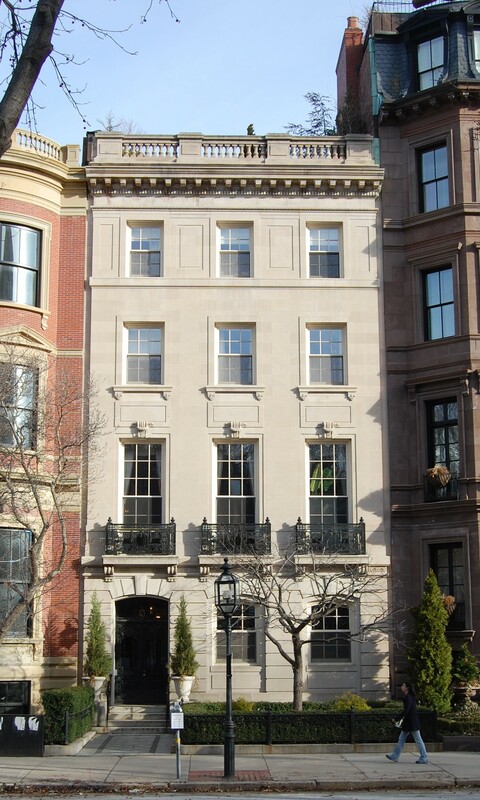 Frederic and Lucy Stone moved soon thereafter to 407 Beacon. 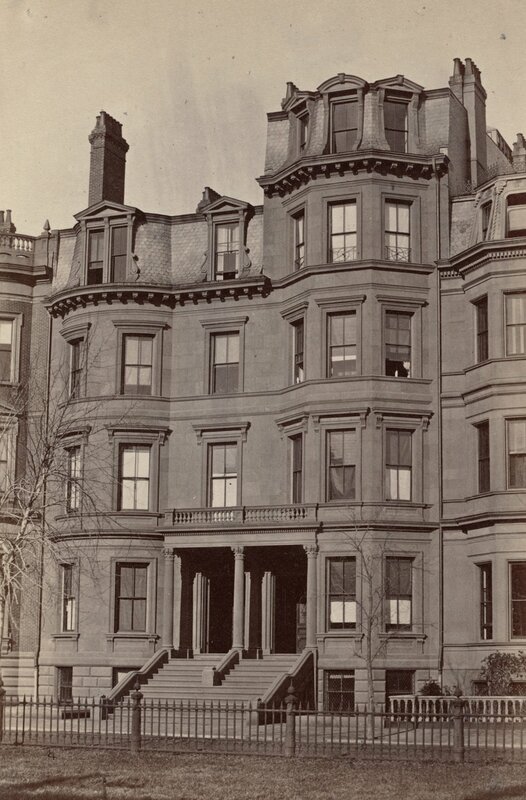 On April 11, 1889, 13 Commonwealth was purchased from the estate of Frederick Bradlee by Mrs. Martha Pickman (Rogers) Codman, widow of John Amory Codman, and their daughter, Martha Catherine Codman. They previously had lived at 17 Mt. Vernon. John Amory Codman had managed his family’s business and real estate interests and was an artist, specializing in landscapes and marine scenes; he had died in December of 1886. Martha (Rogers) Codman died in February of 1905. Martha Codman continued to live at 13 Commonwealth during the 1906-1907 winter season, but moved thereafter, probably to Washington DC, where she was living at the time of the 1910 US Census (she married in February of 1928 to Maxim Karolik, an opera tenor). On February 28, 1907, Martha Codman sold 13 Commonwealth to Anna Lee (Ames) Nowell, the wife of George Manning Nowell, who razed the house.